Stop thinking you could never be a runner and start believing that you can achieve your fitness goals! 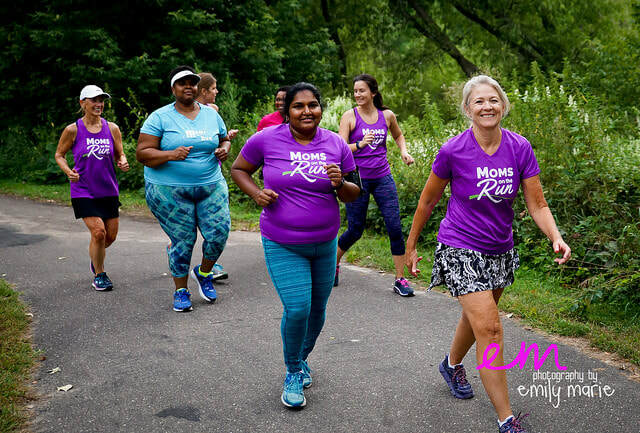 Moms on the Run can help. We’re not just a run club. We’re an instructor-led fitness program with coaching to motivate, educate and encourage you on your journey. You’ll make new friends, find accountability and have fun while working toward a healthier lifestyle. We welcome all women, all ages and all fitness levels. We offer programming for walkers to beginning runners to experienced runners. Walkers will be encouraged to follow an interval training schedule designed to maximize their fitness levels. Our “learn to run” program begins with mostly walking and gradually transitions to more jogging. Experienced runners will be challenged to build their running base, add speed/strength, and endurance. We also offer a great selection of additional strength and cardio training formats. ​Our signature 18-week training program lets you attend classes from 1 to 6 times per week. We offer classes with cardiovascular interval training for all levels concluding with a brief strength training component. We also offer weekly steady paced cardio classes designed to help build endurance and offer an option to increasing mileage. All purchase options include a performance tee or tank. Early bird pricing through 3/15. If you would prefer to pay by check email shoreview@momsontherun.com. Attend 1 session a week, preferably the same session throughout the season. Choose any individual class throughout the winter season. A special class open to all to build strength and stamina prior to the regular season. Meet others at your pace! At White Bear Lake Moms on the Run we love to run - no matter what the weather! 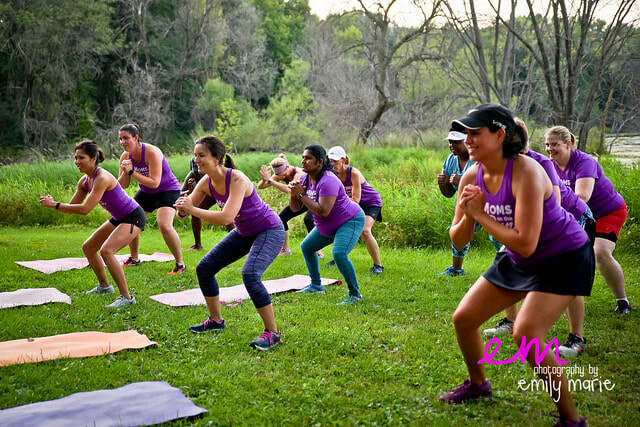 We offer a variety of year-round programming to help you stay in shape and stay connected to our strong community of women. Our signature 18-week training program lets you attend classes from 1 to 5 times per week. We strongly recommend choosing an interval class at least once a week, which includes a higher level of structure and support. From walkers to runners, we meet you at your own level and progress throughout the season. Runners and walkers are welcome! Our 8-week strength and cardio boot camp offers a variety of workout options to help you get fit. We'll help maximize your metabolism by providing run/walk high intensity interval training (HIIT) at your level. Enhance your fitness level by improving strength, muscle tone, speed and agility. Walkers and runners are welcome! Change up your regular running routine and take your fitness indoors or winter outdoor running! ​We'll have fun while getting strong using TRX bands, dumbbells, kettlebells and more. Our indoor 60 minute class combines strength training, cardio and endurance in the ultimate high-intensity interval training format. You'll raise your heart rate and get incredible results. We will also have options to layer up and keep up your endurance with outdoor Polar Club runs.